I had spent the night parked off SR161 and Columbia Pass in Southern Nevada. 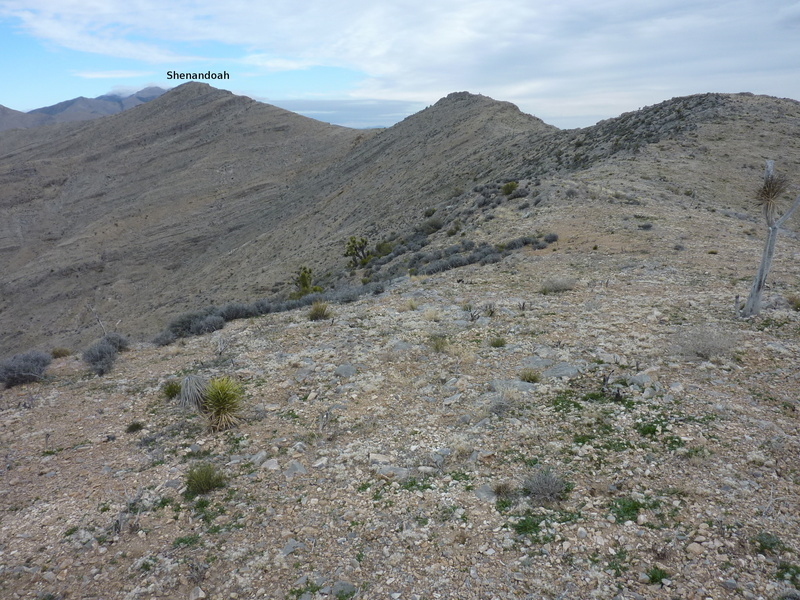 I was in the southern part of the Springs Mountains chasing down some desert summits featured in Wheelock's Desert Peaks Guide and Zdon's Desert Summits. Four of these are located in this part of the range, one of which, Little Devil, I had climbed the previous day. Today I would be after the other three. The first of these was the easiest, only 2.5mi from where I had parked with less than 1,000ft of elevation gain. It was also the least interesting. The route described in the guidebooks follows a somewhat rough road to the summit, leading to a couple of antennae stationed on the broad plateau. The highpoint is found at the western edge of the plateau, barely higher than its surroundings. I found a benchmark but no register in the cairn located there. The better view is off to the west where one looks down on Singer Wash directly below, and Mesquite Valley further in the distance. I took a more direct route on the return, easy cross-country heading NNE, cutting the distance to little more than half the more roundabout ascent route. Total time was about an hour and a half. Those with more clearance can drive most of the way and make this about five minute's effort. This was named by southern miners following the Civil War for the valley in Virginia, site of one of the Confederate States' early victories. The guidebooks describe a route from the north via a ridgeline heading south from Wilson Pass, but to save some unnecessary driving I chose a longer and harder (though still not hard) route from the south starting at SR161, a few miles west of where I started for Table Mtn. It was less than six miles roundtrip with about 2,000ft of gain. Initially I followed a dirt/sand road up Kirby Wash towards the Kirby Mine, turning right to follow a wash up the south side of the mountain. I ran across an open mine tunnel reaching into the hillside adjacent to a dry waterfall, but did not venture inside to explore. Instead, I went up the dry waterfall and followed the wash up until I reached the north-south summit ridge with Shenandoah about a mile further north. There was nothing difficult about the route and it made for a nice hike. A cold wind blowing across the ridge from the east had me favoring the west side as much as possible. I reached the summit by 8:30a where I found a benchmark but no register. Overcast skies subdued the vistas some, but there is a nice view looking up and down the Spring Mountains. The only peaks I could recognize were ones to the south. Potosi was somewhere to the north hidden behind clouds that were becoming increasingly more crowded. Returning south along the ridge, I decided not to drop into the acent wash but take a different route continuing south to follow the crest of the range. Though mostly tame, the route took me over one interesting point with some class 3 rocks to negotiate near its summit. The ridgeline eventually dropped me back down very near where I'd parked the van and by 9:45a I was done. I drove SR161 out to the small town of Jean, NV on Interstate 15. There's not much to it besides a casino, a state prison and a small airport. Behind it on the southeast side rises Sheep Mountain, a small standalone P900. It wasn't in any guidebook that I knew of, but it seemed a neat little peak to visit while I was passing by. It turned out to be the best of the bunch today. My route up Sheep was hardly ideal. In my hasty preparations back home, I had neglected to note a paved road that could have saved a mile each way. Instead I started from S. Las Vegas Blvd at the edge of the airport and hoofed it across the desert, east towards Sheep Mtn. I felt a little stupid crossing the pavement after the first mile. From there I walked another 3/4mi across the desert before starting my way up Sheep via the West Ridge. The ridge is not very distinct and sort of disappears as it runs into the steep West Face encountered higher up. But it makes for a fun route mostly over limestone, climbing steeply in the upper half. The West Face itself is a complex arrangement of caves, buttresses and some helpful chutes with a surprising amount of fun class 3 on a peak I'd never heard of before (the SummitPost page which I found later describes a tamer route from the north). I topped out at the summit at 11:30a. It's rare that I make it to three separate peaks before noon. The view is quite fine though this morning it was growing cold and windy with more ominous clouds moving in from the south - I would not be able to stay long at the top. Though the SummitPost page describes it as rarely visited, the register suggests otherwise. There were some 17 pages of a register filled and an additional 20 scrap pages since the first page from 1994. Most of the entries appear to be from locals who hike to the summit to repair the windsock that has been in place for several decades now. Small private planes and gliders out of the Jean airport regularly fly around the summit on weekends.